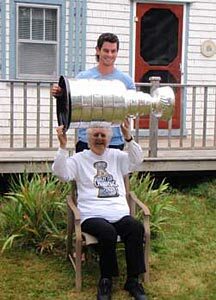 Adam McQuaid helping his grandmother hoist the Stanley Cup during a visit at her home in Cornwall, PEI. The Stanley Cup winged a mari usque ad mare (from sea to sea), arriving in Charlottetown, Prince Edward Island on Sunday, August 28. There, it was accepted by Adam McQuaid, the big rookie defenceman of the Boston Bruins. Adam took the Cup to Cornwall, where he was born and raised, stopping for a photo in front of the sign that sits on the town's outskirts. The first arena at which Adam played is now the North River Market Place, a flea market, but it was important for him to go back to his roots and get a photo with the Cup at the location where he spent so many hours learning the game. McQuaid then did a circuit of all of his various Cornwall schools, including Westwood Primary School, Eliot River Elementary, East Wiltshire Intermediate and Bluefield High School, which he attended before moving to Sudbury, Ontario to play junior. In between these educational visits, Adam took the time to get photos taken with the Stanley Cup in a potato field, exhibiting his pride for the Island's best-known export. The family gathered for a photograph at Adam's grandmother's home, and then they boarded a limo bus to participate in a parade through Cornwall in McQuaid's honour. Now, Adam was most generous in sharing his victory with as many people as he could during his day, but there was one person he did not want to infringe on his day, and that was Irene. Hurricane Irene, to be precise. The threat of a massive, disrupting storm was looming, and yet, it didn't stop thousands of fans from lining the streets of Cornwall to cheer on the hometown hero. Wearing a Bruins sweater as he hoisted the Stanley Cup, Adam and members of his family climbed onto a large amphibious vehicle for the celebration parade. Firetrucks carrying minor hockey players also joined the parade route. The storm threatened, but the power of Lord Stanley's gift to the game kept the winds at bay and the parade went off as planned. On the stage of a nearby fairground, with some 15,000 fans cheering boisterously, Adam McQuaid was honoured by Premier Robert Ghiz and Mayor Barney Fullerton. 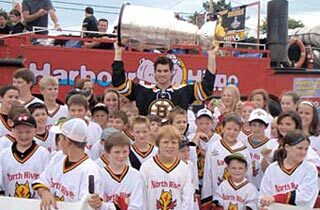 McQuaid was presented with the key to the town and August 28, 2011 was pronounced 'Adam McQuaid Day' in Cornwall. Inside the arena, a special cabinet featuring a sweater, stick and plaque honouring Adam's accomplishments was unveiled and will go on permanent display in the rink. A quick stop at home preceded a very special blessing at a local church, a visit to a seniors' centre and then photos at Dynamic Fitness, where Adam works out. 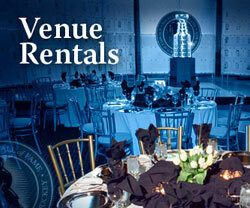 The Stanley Cup party that evening was held at a seaport banquet hack in historic Charlottetown, the province's capital. 450 guests partied with Adam while country star Chad Brownlee, a former draft pick of the Vancouver Canucks, entertained. The evening ended in a building by the airport, where 40 friends consumed pizza and vegetable trays as they spent the last moments with the Stanley Cup. Brad Marchand and the Stanley Cup on their way to City Hall in Halifax, Nova Scotia. 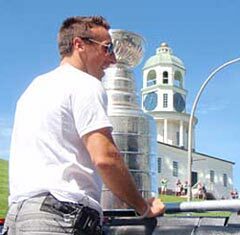 From Prince Edward Island, the Stanley Cup was driven through stormy weather for almost four hours to Halifax, Nova Scotia on Monday, August 29, as it began a long day with Brad Marchand. Brad's first stop was at the home of his grandparents, where he ate an entire box of Cinnamon Toast Crunch cereal out of the bowl of the Stanley Cup. After the Cup was washed thoroughly, Marchand visited the IWK Health Centre Hospital to visit patients, their family and staff. Brad spent a great deal of time in the pediatric ward, cheering up the children. A civic parade took Brad past the historic Halifax Citadel to City Hall. Mayor Peter Kelly announced that August 29, 2011 was 'Brad Marchand Day' in Halifax. About 25 minutes away from Halifax is Hammonds Plains, and that was where 3,000 jammed into St. Margaret's Centre, the arena, to see Marchand and the Stanley Cup to which he contributed so significantly. Brad wears number 63 with the Bruins, so a special raffle was held that allowed 63 guests to meet Brad and get a photo with him and the Stanley Cup. After a quick spin for Brad and the Cup in a magnificent Viper, it was time for the celebration party, this one held at the Lord Nelson Hotel in Halifax. Brad and his siblings Melissa, Rebecca and Jeff, along with their parents Kevin and Lynn, hosted a party for 400, with great food, great beverages and the Stanley Cup in their midst. 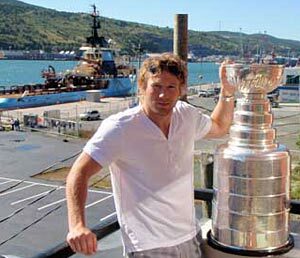 The Stanley Cup visited its third province in three days as Michael Ryder took the Stanley Cup to Newfoundland on Tuesday, August 30. The Boys and Girls Club of St. John's was the first stop in the provincial capital. Ryder is having a new condominium built in the city and while it's not yet ready to move into, Michael insisted on having photos taken in his new home. Just before lunch, Michael met with Premier Kathy Dunderdale as part of a send-off from St. John's on the way to Bonavista. In an official rooftop ceremony at 95 Water Street, the Stanley Cup was placed on a table, but one leg hadn't been properly secured and the table and trophy both went over, leaving a crease in the bowl of the Cup. Fortunately, the dent was readily knocked out and damage to the historic trophy was negligible. Premier Dunderdale, Ryder and the Stanley Cup boarded a 3D Helicopter and made the trip from St. John's to Bonavista. 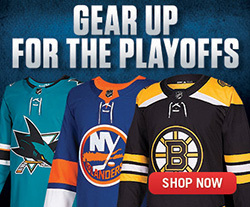 Now, you may think that the Stanley Cup is old�and it is. Born in 1892, it is now 119 years old. But Bonavista is where modern North America began when it was where John Cabot (actually, his name was Giovanni Caboto, but he was sailing under the British flag for King Henry VII) landed in 1497 after two months at sea. The helicopter carrying Michael Ryder and the Stanley Cup landed in Bonavista just after 12:30, settling to earth at RCMP headquarters while cheering crowds gathered around Cabot Stadium. 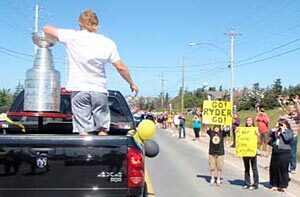 Fans cheering on Michael Ryder and the Stanley Cup during a parade in Bonavista, Newfoundland. Ryder took the Stanley Cup and climbed into a pick-up truck, the headliners in a parade through town with 4,000 fans in attendance, awed at the sight of the Stanley Cup. Following the parade, Michael took the Stanley Cup to a nearby cemetery, spending a few moments in solitude at the grave of his grandfather. There was a viewing at Cabot Stadium for players in the Bonavista-Trinity Minor Hockey Association, as well as coaches and parents. The youngsters lined up by team around the perimeter of the rink and Michael visited each one in turn. At 2:30, Bonavista Mayor Betty Fitzgerald welcomed Ryder back home. Guest speakers toasted the Bruins' champion on the ball diamond behind Cabot Stadium. Then, for four hours, it was a public celebration, with fans getting the opportunity to see the Stanley Cup and snap a photograph with Michael. It had been a long, exhausting day, and Michael brought his day with the Stanley Cup to a close with a party at his parents' home. Guests feasted on crab legs, shrimp, salmon and hamburgers, while a rowboat filled with ice and beer quenched some powerful thirsts. On Tuesday, the Boston Bruins' summer of celebration continues, chronicled exclusively in the Stanley Cup Journal.